Country music star Brad Paisley says his two sons have very different personalities – and he blames it on their birth order. The singer told People Magazine that younger son, Jasper, who’s 1 year old, is "a better kid" than first son, William "Huck," was at the same age. Huck is now 3 years old. "The second kid just kind of takes the table scraps and doesn’t complain as much," he told the magazine. "They instantly feel their place. They’re not the center of the universe so much." Paisley says that both he and his wife, actress Kimberly Williams-Paisley, are both pretty strict with the boys and that discipline is a big deal in their family. "If they can’t understand that you can’t do certain things, there’s going to be trouble in life." He also said that overall the boys are well-behaved and that parenthood is great. "It’s a blast. It’s a thrill a minute. It’s a sleep-deprived state of hallucination and utter joy. It’s great." 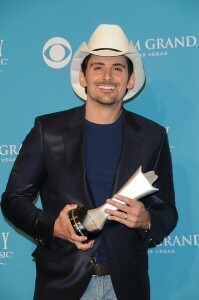 Paisley recently won the top male vocalist award at the Academy of Country Music Awards.